The Queensland Subcontractors' Charges Act 1974 (SCA) has, since 17 December 2018, been replaced by new legislation, albeit in almost identical terms. Unpaid building subcontractors now look to chapter 4 of the Building Industry Fairness (Security of Payment) Act 2017 (Q) (BIFA) which enables subcontractors' charges to be claimed against amounts owed by parties higher up in the contract chain. The BIFA creates new offences for failing to respond to requests for information made by subcontractors or to a notice of claim. Under the SCA, these were steps for which there were no immediate consequences for failing to comply. Whilst there are some technical complexities in the way subcontractors' charges work, in simplified form they operate as follows. The BIFA allows a subcontractor to serve a notice on a principal which creates a charge on the contractor's right to receive payment under a construction contract, and on any security provided under the construction contract. "Security" includes retention monies and any "valuable instrument" (for example, a bank guarantee) which has been given in support of the contractor's obligations. The notice must be given before work under the contract is completed, or within 3 months after practical completion. if the claims of the subcontractors are accepted, the security must still continue to be held until a Court rules on the subcontractors' claims, or alternatively the security can be converted into money and the subcontractors can be paid. Notice must also be given by the subcontractor to the contractor that the claim has been made. The contractor then has 10 business days to respond, in the prescribed form, to the principal and the subcontractor as to whether the claim is accepted, rejected, or accepted in part and otherwise rejected. Amounts admitted by the contractor will be paid directly by the principal to the subcontractor to the extent that there is a obligation to pay a net amount, and pro rated with other subcontractor claimants if there is insufficient funds. Court proceedings must be commenced by the subcontractor within 1 month of the notice of the charge having been given to the principal, or 4 months after the balance of the retention is payable if the notice is in relation to a retention amount only. 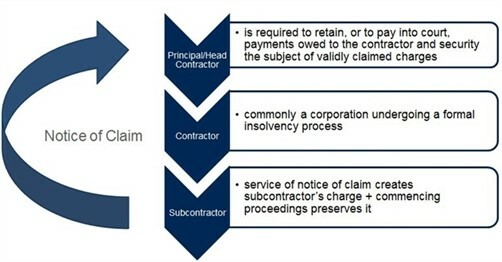 The contractor who receives a compliant notice of claim must2 within 10 business days after receipt of that notice, unless they have a reasonable excuse, provide a written response to the person who issued the notice of claim (that is, ordinarily the principal) and to the subcontractor. Both offences attract a maximum penalty of 20 penalty units (which from the time of commencement of the BIFA on 17 December 2018 would total $2,611 for an individual and $13,055 for a corporation). I'm an insolvency appointee - Should I be worried? Under the BIFA these are offences of the corporation only, not its officers. An extremely common scenario under which a notice of charge will be served is that a contractor corporation has entered administration, liquidation or receivership. Unlike some legislation, the BIFA contains no deemed automatic liability for directors and officers of the corporation, or for administrators, liquidators or receivers. However, that is not the end of the story for the potential for exposure to committing an offence. An officer of a corporation, who causes it to fail to take a step, which in turn results in the corporation committing an offence, may themselves be liable for aiding and abetting the offence3. There is therefore an exposure for an administrator, liquidator or receiver who knowingly causes a corporation to fail to comply with these requests under the BIFA. How realistic is the risk of such a prosecution? The body which determines whether or not to prosecute an offence under the BIFA is the Queensland Building and Construction Commission (QBCC). Under the BIFA, when considering whether to commence a prosecution, the QBCC should consider any relevant guideline prescribed by regulation. As at 28 February 2019, no guideline has been issued, and the QBCC's own 2017 Compliance and Enforcement Strategy is yet to be updated to refer to the new offences. Notwithstanding the low penalty imposed and the absence of guidance as to what action might be taken as a result of such an offence, insolvency practitioners should seek advice in the event that they are at risk of engaging in such an offence. The commission of an offence can have further professional and reputational consequences, in addition to the immediate financial pain which would not be reimbursable out of the assets of the corporation which fails to comply. Ensuring adequate systems are in place to respond to such notices, which can be expected to be served shortly after any appointment, will need to become an additional checklist item for insolvency professionals.